Inexpensive, lightweight and easy to install, roof panels are a prime choice for patio cover additions. Although specifications vary according to panel type and local codes, framing for patio roof panels generally requires less labor and materials than framing for conventional roofing, such as asphalt shingles. However, roofing panels' unique shape and size call for some special framing procedures that increase structural support. With an understanding of standard roof panel framing, you can finalize your design, purchase materials and construct a stable, long-lasting patio cover. Roof panels require crossbeams beneath their overlapping seams. Builders commonly construct a covered patio roof on top of a simple post-and-beam structure. Upright members, called posts, anchor to an existing concrete slab or to cast concrete piers. Horizontal framing members, called beams, stretch across the tops of the posts. The roof's rafters or joists run across opposite beams or attach to a beam on one side and anchor to an existing structure's wall on the other side. Joists or rafters are the roof framing members that slope from a roof's eaves to its ridge. The long edges of patio roof panels, usually called the sides, must align with and fasten to the roof structure's joists. Therefore the spacing between joists must equal the width of a roof panel minus the overlap required by adjacent panels. 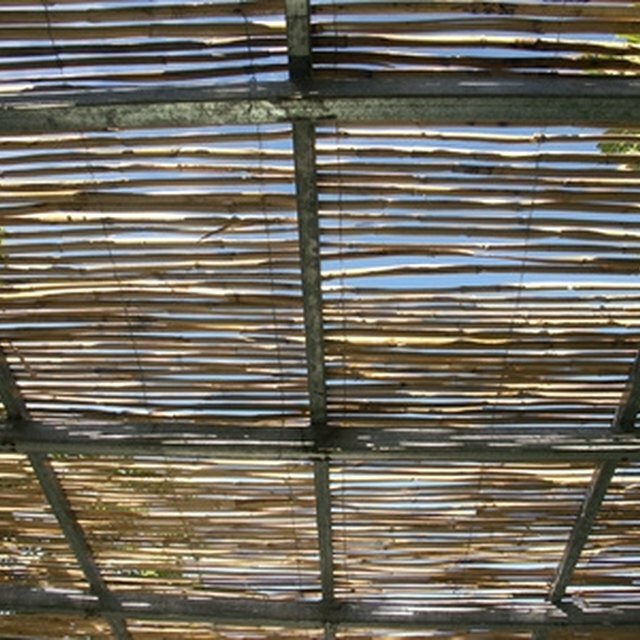 Most roof panels manufactured for patio covers are 26 inches wide. The 26-inch width allows for 2 inches of overlap, meaning that joists are usually spaced every 24 inches. However, always check with your local building authority and roof panel manufacturer to determine specific spacing requirements; wind and snow loads alter conventional framing standards. The short edges of patio roof panels, usually called the top and bottom, must fall over a framing member to allow for fastening. This framing member, called a purlin, runs perpendicularly between the rafters or joists. Regardless of panel length, builders must install purlins at equal intervals to provide support across a roof panel's center. Although specific spacing depends on roof loads and panel span, purlins are often spaced 4 feet apart. Filler strips are lengths of foam or wood that precisely fit the contours of a roofing panel. Builders fasten the strips across the roof frame's purlins to support the panel at the point of fastening. The support provided by filler strips allows roofers to drive screws through the peak of a corrugated panel's ridge pattern without breaking through the panel's surface. Closure strips are similar to filler strips, but are specially designed to provide a weatherproof seal at the patio roof's exposed edges.